For those not in the know, Lucky Luke is a comic book hero, whose thrilling adventures in the Wild West have much in common with the likes of Asterix and Tintin, a fact which is not altogether surprising when their shared European heritage is considered. This is one of Luke's earliest adventures and makes for a pleasing bit if simple old-school multi-genre fun. The game finds Luke having been chosen to protect a new train line that is being built out West, and the first level finds him using his quick-draw reflexes to good effect as he travels around town, taking out bandits on the streets and in the saloon. Luke then has to get his thinking hat on, in order to destroy a boulder which is blocking a train's route. This section is played out more like an adventure, with Luke searching for useful items while avoiding or dealing with the legendary Daltons as well as random Indians. The next level is more of a traditional puzzle, with Luke required to connect lines up in order to allow the train to move freely, while the last one finds him intervening in a water dispute between Comanches and ranchers. Individually, each level is nothing special but when combined, they actually make for a jolly little game, with the kind of variety that is rarely seen today and is more of a hallmark of Robocop and other Ocean classics. The visuals are nice and full of personality, and which help to bring Luke and his comic book adventures to life in proper fashion so while this may be exactly be complex or deep, it is fun and that's just what we expect from Lucky Luke. 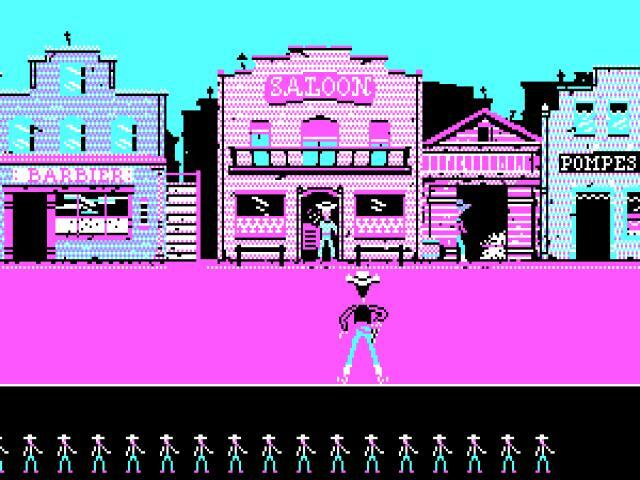 Check out a later Lucky Luke game too, which boasts better graphics but which is equally enjoyable.